It is with the inevitability of Christmas falling on the 25th of December this year that I have started to catch a cold. I can feel that deep ache in my bones and that slightly hazy sluggish feeling creeping into muscles. I cannot count the Christmasses that have been marred by the appearance of a cold, I remember vividly one year having to spend the day with tissue stuffed into my nostrils to stop the unending tide of snot that poured forth. Another year croaking yule tide platitudes from my stinking pit of a bed. My body figures it out far far in advance. It looks to the first available opportunity for being completely at rest and then lets down all the defenses. With enviable Christian charity it lets any stray bug have a bed for the duration of the holidays. Plenty of room at the inn let me tell you. However, I am in combatative mood. I figure this example of British cooking at its very best will ward off any Spanish flu that may be lurking. Bring on that bacterial armada, I have a hefty game pie to stuff in its gunnels. This beauty is a Wild Boar, Wood Pigeon, Hare and Turkey Pie made by a lovely northern couple who's name I did not catch through the thick haze around my head this afternoon in the incredibly surprising Croydon Christmas market. I will endeavour to find out tomorrow what the name of the company is because their pie is a delight. The rich dark meat that is crammed into this pie had me moaning with pleasure between sniffs and sneezes. The massive helping of mashed potatoes and pickles finished off the comfort fest. This was truly everything a pie should be. 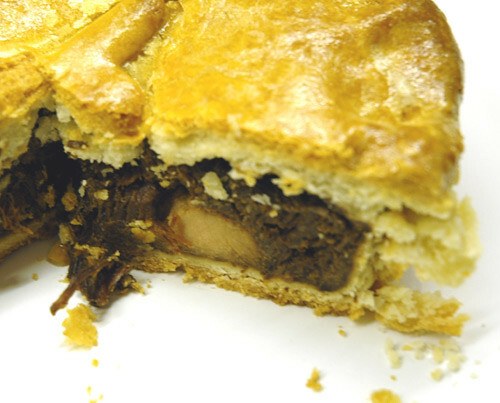 Heavy, meaty with thick crispy pastry. I know I'll be cutting myself another slice in a while. That is inevitable. P.S. This is Monkey Glands 100th post on Jamfaced. Man, I been slack! Best wishes for health, happiness, and a very lofqkhw Christmas! Have a lovely Xmas and a pekrztz New Year.